In its first year of operation, GreenPak’s BATREE collection system doubled the rate of recovered used batteries over previous year, latest figures show. BATREE, a private-industry funded scheme for the collection of batteries and operated by GreenPak Cooperative, has replaced the previous government-run Batterina campaign. Between March 2017 and last February, BATREE successfully recovered 23,621 kilograms of spent batteries compared to an average of between 6,000kg and 10,000kg in previous years. “BATREE has been an astounding success. We attribute this result to our policy of continuous interaction with the public to constantly improve the services offered by GreenPak to the community. It’s heartening to see such a jump in public participation to help safeguard the environment from the damaging effects of badly discarded batteries,” GreenPak CEO Mario Schembri said. In Malta, an estimated two million portable batteries are imported each year. From mobile phones to laptops and other electronic devices, batteries have become an integral part of modern life. By providing these battery collection services, GreenPak is actively engaged in avoiding huge amounts of batteries containing toxic and corrosive materials from being dumped with other household waste. When batteries are not placed in the BATREE bins, these could well end up leaching chemicals into the soil and eventually, into the oceans. “Batteries are essential for our everyday lives but if not disposed of properly, can seriously damage the environment and human health,” Ing. Schembri said. Collected batteries are shipped overseas for recycling.“Everybody has a role to play,” he added. Although the figures for the first year of the BATREE campaign were encouraging, there is still a long way to recover all the batteries entering the market. 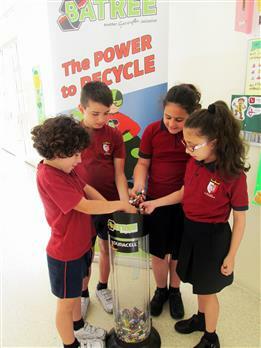 At the moment there are 326 collection points across Malta and Gozo and the bulk of the batteries collected came mainly from schools, outlets, and waste management facilities. The list of collection points can be found here.